Warning: The tests and cutting feats performed in this presentation constitute the abuse of the product and are potentially very dangerous. Any knife can be broken or damaged if subjected to sufficient abuse. 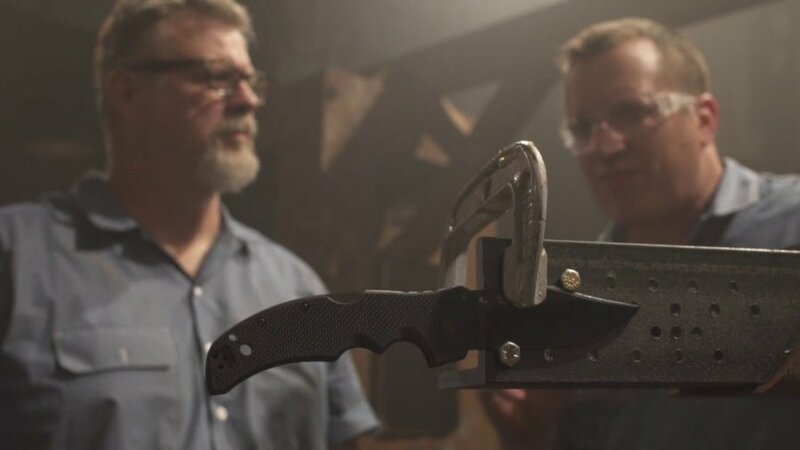 These destructive tests constitute GROSS ABUSE of a knife. Duplicating these tests or altering your knife will void your warranty. The warranty covers defects in materials and/or workmanship. It does not cover the effects of normal wear and tear. DO NOT TRY THIS AT HOME. All meat was carefully preserved and donated to the Ventura County Rescue Mission. The American Bladesmith Society’s guidelines for Master Smith and Journeyman Smith applicants require that (s)he cut through hanging manila or sisal rope, a minimum of one (1) inch in diameter. The applicant must sever the rope in two with one stroke to test the blade’s edge geometry and sharpness.